This data set is generated from brightness temperature data and is designed to provide a consistent time series of sea ice concentrations spanning the coverage of several passive microwave instruments.The data are provided in the polar stereographic projection at a grid cell size of 25 x 25 km. Cavalieri, D. J., C. L. Parkinson, P. Gloersen, and H. J. Zwally. 1996, updated yearly. Sea Ice Concentrations from Nimbus-7 SMMR and DMSP SSM/I-SSMIS Passive Microwave Data, Version 1. [Indicate subset used]. Boulder, Colorado USA. NASA National Snow and Ice Data Center Distributed Active Archive Center. doi: https://doi.org/10.5067/8GQ8LZQVL0VL. [Date Accessed]. This data set is generated from brightness temperature data derived from the following sensors: the Nimbus-7 Scanning Multichannel Microwave Radiometer (SMMR), the Defense Meteorological Satellite Program (DMSP) -F8, -F11 and -F13 Special Sensor Microwave/Imagers (SSM/Is), and the DMSP-F17 Special Sensor Microwave Imager/Sounder (SSMIS). The data are provided in the polar stereographic projection at a grid cell size of 25 x 25 km. This product is designed to provide a consistent time series of sea ice concentrations (the fraction, or percentage, of ocean area covered by sea ice) spanning the coverage of several passive microwave instruments. To aid in this goal, sea ice algorithm coefficients are changed to reduce differences in sea ice extent and area as estimated using the SMMR and SSM/I sensors. The data are generated using the NASA Team algorithm developed by the Oceans and Ice Branch, Laboratory for Hydrospheric Processes at NASA Goddard Space Flight Center (GSFC). These data include gridded daily (every other day for SMMR data) and monthly averaged sea ice concentrations for both the north and south polar regions. The data are produced at GSFC about once per year, with roughly a one-year latency, and include data since 26 October 1978. Data are produced from SMMR brightness temperature data processed at NASA GSFC and from SSM/I and SSMIS brightness temperature data processed at the National Snow and Ice Data Center (NSIDC). Data are scaled and stored as one-byte integers in flat binary arrays. For each data file, a corresponding PNG browse image file is provided. Basic limitations also arise from the sensor resolution, temporal coverage, and algorithm assumptions and characteristics. The NASA Team algorithm is not designed to provide ice concentration for fresh-water ice (for example, lake and river ice). The filtering used to remove land-to-ocean spillover may affect the area of some open water features within the ice pack near coasts (coastal polynyas). Users should be aware that the ice concentration maps were derived from algorithms that were "tuned" to minimize the differences in ice extent and ice covered area during the overlap periods when transitioning from one instrument to the next (overlap from SMMR to DMSP-F8 SSM/I, from DMSP-F8 to -F11 SSM/I, from DMSP-F11 to -F13 SSM/I, and from DMSP-F13 SSM/I to DMSP-F17 SSMIS). This does not mean that the ice concentrations themselves are well matched. See the Data Verification by Data Center section of this document for a summary of ice extent and ice covered area differences during the overlap periods. It is also important to know that SMMR and SSM/I-SSMIS have different data gaps at the North Pole due to orbital differences. Therefore, any time series of parameters, such as ice extent and ice covered area, need to take these differences into account. A pole mask is provided for this purpose. See the Masks and Overlays webpage for more details. Particular care is needed to interpret the sea ice concentrations during summer when melt is present, and in regions where new sea ice makes up a substantial part of the sea ice cover. Some residual errors remain due to weather effects and mixing of ocean and land area within the sensor field of view, or FOV, and due to sensor differences. It is recommended that sea ice extent and area be computed from daily maps of ice concentrations that are then used to compute monthly averages of those parameters. Computations of sea ice extents and sea ice areas should not be made from the monthly-averaged ice concentration maps because that may result in a biased time series. Sea ice concentration represents an areal coverage of sea ice. For a given grid cell, the parameter provides an estimate of the fractional amount of sea ice covering that cell, with the remainder of the area consisting of open ocean. Land areas are coded with a land mask value. Data sources are Nimbus-7 SMMR, DMSP-F8, -F11 and -F13 SSM/I instruments, and the DMSP-F17 SSMIS instrument. Data are stored as one-byte integers representing sea ice concentration values. The sea ice concentration data are packed into byte format by multiplying the derived fractional sea ice concentration floating-point values (ranging from 0.0 to 1.0) by a scaling factor of 250. For example, a sea ice concentration value of 0.0 (0%) maps to a stored one-byte integer value of 0, and a sea ice concentration value of 1.0 (100%) maps to a stored one-byte integer value of 250. To convert to the fractional parameter range of 0.0 to 1.0, divide the scaled data in the file by 250. To convert to percentage values (0% to 100%), divide the scaled data in the file by 2.5. Data files may contain integers from 0 to 255, as described in Table 1. Data are provided in scaled, unsigned flat binary files (.bin) with one byte per pixel; they have no byte order or endianness. Data are stored as one-byte integers representing scaled sea ice concentration values. For each data file, a corresponding browse image file in PNG format is also provided. Extensible Markup Language (.xml) files with associated metadata are also provided. a 70-byte character string containing ancillary information such as data origin, data set creation date, etc. For compatibility with ANSI C, IDL, and other languages, character strings are terminated with a NULL byte. The file header can be accessed in a variety of ways. For example, it can be treated as a simple sequence of bytes containing ASCII character strings or as a complex data structure of arrays. Table 2 describes the file header. The data can be read with image processing software by specifying a 300-byte header, with an image size of 304 columns x 448 rows for Arctic data and 316 columns x 332 rows for Antarctic data. For example, in a high-level programming language or image processing software, declare a 300-byte array for the header and a 304 x 448 Arctic image array. Read the 300-byte header array first, then read the image array. Within this directory, folders are organized by date in YYYY.MM.DD format, for example /1993.08.01/. Each folder contains the sea ice concentration data files, browse images, and associated metadata for both the Northern and Southern Hemispheres. Monthly files are also included in the folder for the first day of each month. Data set coverage includes the polar regions defined by the Polar Stereographic Projections and Grids spatial coverage map. Each of the three instruments provide global coverage except for a circular sector centered over the North Pole. These sectors are never measured due to orbit inclination of the satellite. Table 5 shows the sizes and latitudes of each of the pole holes. The SSMIS pole hole was implemented in March 2015 and applied to all data from January 2008 to present. Even though SSMIS data begin in January 2007, this product does not start using the SSMIS pole hole mask until January 2008 to allow for comparison analysis with SSM/I during the transition from SSM/I to SSMIS data in 2007. The sea ice concentration data are displayed in polar stereographic projection. For more information, see Polar Stereographic Projections and Grids. The grid size varies depending on the region, as shown in Table 6. Data are from 26 October 1978 through the most current processing. See the "Acquisition" section of this document for dates by instrument and platform. The SMMR instrument scanner operated only on alternate days, due to spacecraft power limitations. Therefore, SMMR data were only collected every other day. Typically, there are at least 14 days of coverage per month, although there are major data gaps in August of 1982 (04, 08, and 16 August 1982), and in August of 1984 (13 through 23 August 1984) for both polar regions. SSM/I data were collected daily and SSMIS data continue to be collected daily. A major data gap in the SSM/I data exists from 03 December 1987 to 13 January 1988. For the latest details regarding data gaps, refer to the SSM/I-SSMIS Brightness Temperature Data Availability web page. Sea ice concentrations are provided for each day of data and also as monthly means. The monthly means are generated by averaging all the available daily files for each individual month, excluding pixels of missing data. Refer to the Monthly Data Generation section of this document for more information. The SMMR, SSM/I, and SSMIS instruments are microwave radiometers that sense emitted microwave radiation. This radiation is affected by surface and atmospheric conditions, and thus provides a range of geophysical information. The combined SMMR, SSM/I, and SSMIS sea ice concentration time series is produced from brightness temperatures obtained from GSFC and NSIDC. The four sets of satellite data currently used to create this data stream and the time periods for which the data are available are shown in Table 7. Sea ice concentrations were processed by GSFC using SMMR brightness temperatures. The SMMR brightness temperatures were processed and quality checked at GSFC (Gloersen et al. 1992). SSM/I and SSMIS brightness temperature data used to create this sea ice concentration time series are distributed by NSIDC. Processing of DMSP-F17 SSMIS brightness temperatures is ongoing. This section is extracted from NASA Technical Memorandum 104647. Sea ice concentrations for this data set were produced using a revised NASA Team algorithm that uses a different set of tie points and weather filters than the original NASA Team algorithm. See the NASA Team Sea Ice Algorithm for a description of the original algorithm. The NASA Technical Memorandum 104647 includes information about differences, such as tie points, between the original algorithm and the revised NASA Team algorithm. In addition, the NASA Team algorithm uses different channels of the SMMR and the SSM/I-SSMIS brightness temperature data (Table 8). The weather filter used for the SMMR (Gloersen and Cavalieri 1986) was found to be inadequate for the SSM/I due to the SSM/I's use of the 19.3 GHz channel (which is further up on the shoulder of the water vapor line at 22.2 GHz) rather than the 18.0 GHz channel. A different weather filter is used to reduce spurious sea ice concentrations from SSM/I that result from the presence of atmospheric water vapor, non-precipitating cloud liquid water, rain, and sea surface roughening by surface winds. This filter is a combination of the SSM/I 37.0 and 19.3 GHz channels, which effectively eliminates most of the spurious sea ice concentration measurements resulting from wind-roughening of the ocean surface, cloud liquid water, and rainfall. Another filter that is based on the 19.3 and 22.2 GHz channels is also used. The rationale behind combining the 19.3 and 22.2 GHz channels is based on the sensitivity of the 22.2 GHz to water vapor and on the need to minimize the effect of ice temperature variations at the ice edge. Comparisons of sea ice concentrations calculated for each sensor during overlap periods using published algorithm tie points reveal significant differences. These may result from differences in sensor and orbital characteristics, differences in observation times (and therefore tidal effects), and/or differences in algorithm coefficients. Sensor and orbital characteristic differences for the Nimbus-7 SMMR and DMSP-F8 SSM/I include antenna beam width, channel frequency, spacecraft altitude, ascending node time, and angle of incidence. In addition, the sea ice algorithm tie points are significantly different. The DMSP sensors also differ in ascending node time, altitude, and angle of incidence. Because the visit times of the DMSP satellites occur during different phases of the diurnal cycle, tidal effects may result in differences in the sea ice distribution. GSFC presumes that any such effects are mitigated by the correction scheme described below. The Comparison of Orbital Parameters table in the Instrument section of this document summarizes sensor and orbital characteristic differences. The GSFC processing attempts to accommodate for these differences in each pair of sensors by employing a set of algorithm tie points determined through linear relationships between the observed brightness temperatures during the overlap periods. Daily brightness temperature maps from the Nimbus-7 SMMR and from the DMSP-F8 SSM/I during their period of overlap, 09 July to 20 August 1987, were compared for both the Arctic and Antarctic. Unfortunately, there were only 22 days of common coverage. A linear, least-squares best-fit of the cumulative data was obtained for each of the corresponding channels. For the purpose of eliminating spurious brightness temperatures resulting from residual land spillover effects, an Arctic land mask that expanded three to four pixels out from the original land mask was used in the determination of the best fit between the two data streams. The eliminated pixels represent only a very small fraction of the total number of sea ice concentration pixels, but eliminating them helps considerably in reducing the outliers on the scatter plots. These linear relations were used to generate a set of SSM/I tie points that are consistent with the original SMMR sea ice algorithm tie points (Gloersen et al. 1992). The published DMSP-F8 SSM/I tie points (Cavalieri et al. 1992) were not used. In addition to using these transformations, the DMSP-F8 SSM/I open water tie points were subjectively tuned to help minimize the differences between the SMMR and DMSP-F8 SSM/I sea ice extent and area during the overlap period. In all cases, except for the Antarctic DMSP-F8 SSM/I values, the tuned amount is within one standard error of estimate. GSFC suspects the reason for the larger tuned values results from greater weather effects during the overlap period. For more information on the regression coefficients and revised tie points, see the NASA Technical Memorandum 104647. 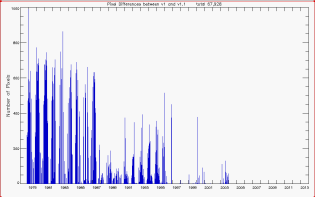 The transition period from DMSP-F8 to -F11 includes only 16 days of good data overlap, from 03 to 18 December 1991. The DMSP-F11 SSM/I open water tie points were also tuned to help reduce differences in sea ice extent and area as was done with the DMSP-F8 SSM/I values. A further adjustment to the Antarctic 37V sea ice type-B F11 tie point was also made to reduce the sea ice area difference. In this case, the amount of tuning needed to reduce the sea ice extent and area differences between the DMSP-F8 and -F11 values is well within one standard error of estimate. The effects of changing from the DMSP-F11 to the -F13 satellite were examined for a 5-month overlap period, from 5 May 1995 through 30 September 1995. Generally, in terms of hemispheric averages of mean ice concentration, the biases introduced by the transition are slight and not statistically significant; however, in some regions relatively large and significant differences are seen. In addition, differences in sea ice extent and total ice covered area between the two platforms were found to be statistically significant. For more information, please see NSIDC Special Report 5: An Intercomparison of DMSP F11- and F13-derived Sea Ice Products. The effects of changing from the DMSP-F13 SSM/I to the -F17 SSMIS were examined for a 12-month overlap period, from 01 January 2007 to 31 December 2007. Differences in sea ice extent and total ice covered area between the two platforms and instruments were found to be statistically significant, though fairly similar when compared with previous intersensor calibrations conducted for this time series (Cavalieri et al. 1999). Earlier intersensor calibrations, however, were limited by relatively short periods of sensor overlap (such as sixteen days) and could thus account for less agreement with this transition (Cavalieri et al. 2012). In addition, earlier agreement may be due to the subjective tuning of some tie-points that was required in past intercalibrations (Cavalieri et al. 1999). The next step in preparing the data is the correction for land-to-ocean spillover, often referred to as "land contamination," and residual weather-related effects. While these steps eliminate much of the land-to-ocean spillover and weather effects over open ocean, these problems are not entirely removed. See the section Data Verification by Data Center for additional comments. Land-to-ocean spillover refers to the issue of the blurring of sharp contrasts in brightness temperature, such as those that exist between land and ocean, due to the relatively coarse width of the sensor antenna pattern. This problem is of concern because it results in false sea ice signals along coastlines because both land and sea ice have much higher brightness temperatures than ocean. The method used to reduce the spillover is an extension of the method employed for the single-channel Nimbus-5 Electrically Scanning Microwave Radiometer (ESMR) data in Parkinson et al. (1987). Figure 1a illustrates the effect of the coarse resolution of the microwave antenna on a coastline resulting in false sea ice signals in the vicinity of the coast, and Figure 1b shows the seven-by-seven array used in the procedure to reduce the land-to-ocean spillover effect. The rationale behind the approach is that a minimum observed sea ice concentration in the vicinity of coastlines where no sea ice remains offshore, which is generally seen in late summer, is probably the result of land spillover; so it is subtracted from the image. To reduce the error of subtracting sea ice in areas of actual sea ice cover, the technique searches for and requires the presence of open water in the vicinity of the image pixel to be corrected. A matrix M was created covering the entire grid and identifying each pixel as land, shore, near-shore, offshore, or non-coastal ocean. The identification of land pixels was straightforward; they were obtained from the land/sea mask. 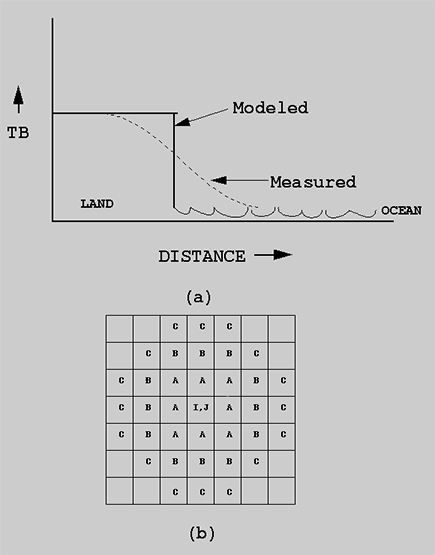 The identification of shore, near-shore, and offshore pixels was based on the scheme shown in Figure 1b, where the pixel to be identified is labeled I,J. This pixel is considered a shore pixel if any pixel adjacent to it is land, a near-shore pixel if none of the A pixels are land but at least one of the B pixels is land, and an offshore pixel if none of the A or B pixels are land but at least one of the C pixels is land. All other ocean pixels are considered non-coastal ocean. This matrix M is created once and used throughout the data set. A matrix CMIN, to represent minimum sea ice concentrations on a pixel-by-pixel basis throughout the entire grid, was created for each instrument type. CMIN was created by first constructing a matrix P containing the minimum monthly average sea ice concentrations throughout a given year, then adjusting that matrix at offshore, near-shore, and shore pixels. In the case of SMMR, 1984 monthly data were used, whereas in the case of SSM/I, 1992 monthly data were used. In both cases, the adjustments were as follows: (a) at offshore pixels, any P values exceeding 20 percent were reduced to 20 percent; (b) at near-shore pixels, any P values exceeding 40 percent were reduced to 40 percent; and (c) at shore pixels, any P values exceeding 60% were reduced to 60 percent. The CMIN matrix was created once for SMMR and once for SSM/I, then used throughout the data set. The daily sea ice concentration matrices were adjusted at any offshore, near-shore, and shore pixels in the vicinity of open water. Specifically, the neighborhoodof an offshore pixel was defined as containing the 8 other pixels in the 3 x 3 box centered on the offshore pixel; the neighborhood of a near-shore pixel was defined as containing the 24 other pixels in the 5 x 5 box centered on the near-shore pixel; and the neighborhood of a shore pixel was defined as containing the 48 other pixels in the 7 x 7 box centered on the shore pixel. At any time when the neighborhood of an offshore, near-shore, or shore pixel contains three or more open-water pixels (sea ice concentration less than 15 percent), then the calculated sea ice concentration at the offshore, near-shore, or shore pixel is reduced by the value for that pixel in the matrix CMIN. Wherever the subtraction leads to negative sea ice concentrations, the concentrations are set to 0 percent. This land-spillover correction algorithm is clearly a rough approximation, as the contaminated amount does not stay constant over time; but the scheme has been found to reduce substantially the spurious sea ice concentrations on the grids. Figure 1a. Effect of the coarse resolution of the microwave antenna on a coastline resulting in false sea ice signals in the vicinity of the coast. Figure 1b. Seven-by-seven array used in the procedure to reduce the land-to-ocean spillover effect. In the Northern Hemisphere, in any pixel where the monthly SST is greater than 278 K, the sea ice concentration is set to zero throughout the month. In the Southern Hemisphere, in any pixel where the monthly SST is greater than 275 K, the sea ice concentration is set to zero throughout the month. The higher threshold SST value was needed in the Northern Hemisphere because the 275 K isotherm used in the south was too close to the sea ice edge in the north. In a few instances, corrections to the regridded SST data were needed, because otherwise actual sea ice was being lost. Figure 2a shows a sample sea ice concentration field without the land-spillover and residual weather correction, and Figure 2b shows that same sample after the correction is applied. The automated residual weather removal procedures unfortunately do not remove all spurious ice. In the older data in particular, clearly erroneous sea ice concentration values occurred on occasion due to bad input brightness temperatures, sometimes even with entire scans or swaths being dominated by bad data. Consequently, a manual quality control procedure was used to remove these erroneous data. This is done by visual inspection of the ice concentration images. In some instances, the erroneous nature of the data is quite clear, while in other instances it is less definitive. In the latter cases, a decision to retain or remove the suspect data is made based on consistency or lack of consistency with the data for the preceding and succeeding days. For data deemed to be spurious in the open ocean region, the ice concentrations are zeroed out. Data deemed to be erroneous within the ice cover are flagged as missing data and are filled like other data gaps, as described below. There are instances of missing data. In some cases whole days (or weeks or months) are missing. In other cases, large swaths or wedges of missing data exist within an image, along with scattered pixels of missing data throughout the grid. The scattered pixels of missing data, resulting generally from mapping the orbital data to the SSM/I grid, were filled by applying a spatial linear interpolation scheme on the brightness temperature maps. The larger areas of missing data, resulting from gaps between orbital swaths (generally at low latitudes on daily maps) or from partial coverage or missing days, were filled by temporal interpolation on the sea ice concentration maps. No data at all were available for the period from 02 December 1987 through 12 January 1988. This gap was not filled by temporal linear interpolation; instead it was left as missing data. Once daily data have been processed as previously described, monthly data are generated. Monthly averaged sea ice concentration grids are produced from an average of the daily sea ice concentration grids available for each month. Monthly files for both hemispheres are provided for every month beginning October 1978. However, for October 1978, December 1987 and January 1988, the time series was incomplete: only three days of data were available during October 1978 to generate the monthly mean, only two days were available for December 1987, and only 19 days were available for January 1988. Therefore, the monthly means for these months do not represent the "true" monthly means. In most cases, GSFC used all daily data to compute monthly averaged sea ice concentrations from a particular instrument until the data were no longer available. For example, SMMR data were used to compute monthly sea ice concentrations until the instrument stopped collecting data on 20 August 1987. Beginning 21 August 1987, SSM/I data were used. In 1991, DMSP-F8 SSM/I data were used through December 18; beginning December 19, DMSP-F11 SSM/I data were used. Note: It is recommended that sea ice extent and area be computed from daily maps of ice concentrations that are then used to compute monthly averages of those parameters. Computations of sea ice extents and sea ice areas should not be made from the monthly-averaged ice concentration maps because that may result in a biased time series. The performance of the NASA Team algorithm was assessed in numerous studies such as Cavalieri et al. 1992, and these results apply to this data set. However, improvements in this data set that differ from previous studies include the minimization of coastal and open-ocean influences that tend to yield inaccurate sea ice concentrations. Visual data checking was used to assess the performance of these modifications. Estimates of the accuracy of the NASA Team algorithm vary depending on sea ice conditions, methods, and locations used in individual studies. Cavalieri et al. (1992) summarizes several of these studies. In general, accuracy of total sea ice concentration is within +/- 5 percent of the actual sea ice concentration in winter, and +/- 15 percent in the Arctic during summer when melt ponds are present on the sea ice. Accuracy tends to be best within the consolidated ice pack when the sea ice is relatively thick (greater than 20 cm) and ice concentration is high. Accuracy decreases as the proportion of thin ice increases. See Cavalieri et al. (1992), Steffen et al. (1992), and other listed references for an overview of the algorithm performance. NSIDC staff visually checks the data files and selected graphics files. This includes verification of proper file structure; comparisons to existing SMMR-, SSM/I-, and SSMIS-derived sea ice concentration grids, masks, and information files; and examination of data quality. Some weather-related effects and land contamination are still present. The amount and spatial distribution of remaining weather effects vary with season. Also, occasional bad scan lines still appear in the data. Based on NSIDC analyses, some sensor-to-sensor differences are likely to remain in these data, particularly for marginal ice zones. See NSIDC Special Report 5: An Intercomparison of DMSP F11- and F13-derived Sea Ice Products for summaries of differences among the SSM/I sensors. Residual weather effects and processing errors in May 1986 data result in large bands of very low ice concentrations over the open ocean in the Weddell, Bellingshausen, and Amundsen seas in the Southern Hemisphere. Although the magnitude of these false ice concentrations is less than one percent, users should be aware that such errors do occur in data for many days within that month. Overlap periods exist when transitioning from one instrument to the next. These overlaps are from SMMR to DMSP-F8 SSM/I, from DMSP-F8 to -F11 SSM/I, from DMSP-F11 to -F13 SSM/I, and from DMSP-F13 SSM/I to DMSP-F17 SSMIS. During overlap periods, data were available from two instruments, although good data may not be available from both instruments during the entire operating overlap. Differences in ice covered area and ice extent during the overlap periods were minimized by tuning the sea ice algorithms. Wavelet analysis of the time series of ice extent and ice covered area show no significant offsets between the different satellites. Tables 9 and 10 summarize the comparison between the ice covered areas and ice extent during the overlap periods, including mean differences and linear regression results of ice covered areas and ice extent. Mean differences are computed for SMMR minus DMSP-F8 SSM/I, DMSP-F8 SSM/I minus DMSP-F11 SSM/I, DMSP-F11 SSM/I minus DMSP-F13 SSM/I, and DMSP-F13 SSM/I minus DMSP-F17 SSMIS. Regression coefficients are computed using y = a0 + a1*x, for each (x, y) pair (x=SMMR, y=DMSP-F8 SSM/I); (x=DMSP-F8 SSM/I, y=DMSP-F11 SSM/I); (x=DMSP-F11 SSM/I, y=DMSP-F13 SSM/I); and (x=DMSP-F13 SSM/I, y=DMSP-F17 SSMIS). While this analysis shows no significant differences between the overall summaries of ice covered area and ice extent, significant regional differences in ice concentration may still be present. Table 11 describes files that have been found to contain errors and that have been corrected during the life of this data set along with the types of errors that were corrected. NSIDC recommends data users download the corrected files for these dates listed in Table 11. In addition, more detail on the updates can be found in Table 16. Additional Quality Control (QC) of the data set was done from 1978 to 2014 to remove additional spurious ice. Figures 3 and 4 show the number of pixels that are different across the time series due to the additional QC. The SMMR is a 10-channel instrument delivering orthogonally polarized antenna temperature data at five dual-polarized (horizontal, vertical) frequencies: 6.6 GHz, 10.7 GHz, 18.0 GHz, 21.0 GHz, and 37.0 GHz. The SSM/I is a seven-channel, orthogonally polarized, passive-microwave radiometric system. The instrument measures combined atmosphere and surface radiances at 19.3 GHz, 22.2 GHz, 37.0 GHz and 85.5 GHz frequencies. The SSMIS sensor is a conically-scanning passive microwave radiometer that harnesses the imaging and sounding capabilities of three previous DMSP microwave sensors, including the SSMI, the SSM/T-1 temperature sounder, and the SSMI/T-2 moisture sounder. The SSMIS sensor measures microwave energy at 24 frequencies from 19 to 183 GHz with a swath width of 1700 km. Tables 12 and 13 give the FOV of each instrument. For more details regarding the SMMR, SSM/I, and SSMIS sensors, please refer to the SMMR, SSM/I, and SSMIS Sensors page. The Nimbus-7 and DMSP F-series spacecraft fly in near-polar sun-synchronous orbits; details their respective orbits are compared in Table 14. (Local Time) Approx. 12:00 p.m. Approx. 6:00 a.m. Approx. 5:00 p.m. Approx. 5:43 p.m. Approx. 5:31 p.m.
1 Indicates sensor and spacecraft orbital characteristics of the sensors used in generating the sea ice concentrations. Software tools are available via the Polar Stereographic Data Tools web page. Software includes IDL routines to ingest and read sea ice concentration data. Masks and overlays are also provided. Table 9 lists the tools that can be used with this data set. For a comprehensive list of all polar stereographic tools and for more information, see the Polar Stereographic Data Tools web page. Table 16 summarizes the Version history for this product. Data were reprocessed from 1978 to 2014, and additional QC of the data set was done to remove additional spurious ice. Refer to Figure 3 and Figure 4, which show the number of pixels that are different across the time series due to the additional QC. In addition, the data set no longer includes overlap dates during satellite transition periods. Refer to Table 13 for the time periods of each satellite used in this data set. This version also extends the temporal coverage to 31 May 2015. V1 March 2015 SSMIS pole hole mask replaces SSM/I pole hole mask for all data from 01 January 2008 to present. 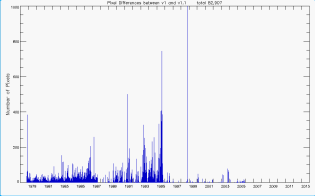 V1 July 2014 An error was found in the sea ice concentration field for 14 September 1984. Due to a geolocation error in the source data, several hundred thousand square kilometers of erroneous ice occurred in that data. The original file has been removed and replaced with an average of the two files nearest in time (September 12 and 16). The monthly September 1984 average concentration field was reprocessed using the replaced September 14 data. See Table 12 for the file names and the correction made. V1 June 2014 The browse images for the entire record have been reprocessed to include a title and simplified color bar; the data were not affected. V1 January 2013 NSIDC applied corrections to 29 files that showed errors in a previous release of these data. The errors occurred in files from both SMMR (1983 – 1985) and SSM/I (1995 – 1996). See Table 12 for a list of these files. V1 January 1996 Original version of data. Instructions for importing these data into ArcGIS, as well as other How To topics and FAQs, are provided at the NSIDC Knowledge Base. Bonbright, D. I. 1984. PODS SSM/I Functional Requirements (Version 1.0). Jet Propulsion Laboratory Document 715-63. Bonbright, D. I., J. W. Brown, J. E. Hilland, I. T. Hsu, J. A. Johnson, T. L. Kotlarek, R. A. Lassanyi, C. L. Miller, C. S. Morris, and F. J. Salamone. 1987. NASA Ocean Data System Version 3.0. User handbook. Jet Propulsion Laboratory. Document 715-66, 50 pp. Cavalieri, D. J., P. Gloersen, and T. T. Wilheit. 1986. Aircraft and Satellite Passive-microwave Observations of the Bering Sea Ice Cover During MIZEX West. IEEE Transactions on Geosciences and Remote Sensing GE-24: 368-377. Cavalieri, D. J., C. l. Parkinson, P. Gloersen, and H. J. Zwally. 1997. Arctic and Antarctic Sea Ice Concentrations from Multichannel Passive-microwave Satellite Data Sets: October 1978 to December 1996, User's Guide. NASA Technical Memorandum 104647. 17 pages. Cavalieri, D. J., and C. L. Parkinson, 2012: Arctic sea ice variability and trends, 1979-2010, The Cryosphere, 6, 881-889, doi:10.5194/tc-6-881-2012. Comiso, J. C., and A. L. Gordon. 1987. Recurring Polynyas over the Cosmonaut Sea and the Maud Rise. Journal of Geophysical Research 92:2819-2833. Gloersen, P. 1995. Modulation of Hemispheric Sea Ice Covers by ENSO Events. Nature 373:503-508. Gloersen, P. 1983. Calibration of the Nimbus-7 SMMR: II Polarization Mixing Corrections. NASA Technical Memorandum 84976. Gloersen, P. and W. J. Campbell. 1988. Satellite and Aircraft Passive-microwave Observations During the Marginal Ice Zone Experiment in 1984. Journal of Geophysical Research 93:6837-6846. Gloersen, P., C. l. Parkinson, D. J. Cavalieri, J. C. Comiso, and H. J. Zwally. 1999. Spatial Distribution of Trends and Seasonality in the Hemispheric Sea Ice Covers: 1978-1996. Journal of Geophysical Research 104(9): 20,827-20,835. Gloersen, P., T. C. Chang, T. T. Wilheit, and W. J. Campbell. 1974. Polar Sea Ice Observations by Means of Microwave Radiometry, in Advanced Concepts and Techniques in the Study of Snow and Ice, H. S. Santeford and J. L. Smith, eds., National Academy of Science 541-550. Gloersen, P., T. T. Wilheit, T. C. Chang, W. Nordberg, and W. J. Campbell. 1974. Microwave Maps of the Polar Ice of the Earth. Bulletin of the American Meteorological Society55:1442-1448. Hughes Aircraft Company. 1986. Data Requirements Document for Fleet Numerical Oceanography Center, Rev. B.
Hughes Aircraft Company. 1980. Special Sensor Microwave Imager (SSM/I), Computer Program Product Specification (Specification for FNMOC). Vol. II, Sensor Data Processing, Computer Program Component (SMISDP). Johannessen, O. M., E. V. Shalina, and M. W. Miles. 1999. Satellite evidence for an Arctic sea ice coverage in transformation, Science, 286, 1937â€“1939. Kwok, R. 2002. Sea ice concentration estimates from satellite passive microwave radiometry and openings from SAR ice motion. Geophys. Res. Lett., 29(9), doi:10.1029/2002GL014787. Levitus, S. and Boyer, T. P. 1994. World Ocean Atlas 1994, Volume 4: Temperature, NOAA National Oceanographic Data Center, Ocean Climate Laboratory, U.S. Department of Commerce, Washington D. C.
Parkinson, C. l. 1991. Interannual Variability of the Spatial Distribution of Sea Ice in the North Polar Region. Journal of Geophysical Research 96:4791-4801. Parkinson, C. l. 1983. On the Development and Cause of the Weddell Polynya in a Sea Ice Simulation. Journal of Physical Oceanography 13:501-511. Rothrock, D. A., D. R. Thomas, and A. S. Thorndike. 1988. Principal Component Analysis of Satellite Passive-microwave Data over Sea Ice. Journal of Geophysical Research93:2321-2332. Sigmond, M., J. C. Fyfe, G. M. Flato, V. V. Kharin, and W. J. Merryfield. 2013. Seasonal forecast skill of Arctic sea ice area in a dynamical forecast system. Geophys. Res. Lett., 40, doi:10.1002/grl.50129. Snyder, J. P. 1987. Map Projections - A Working Manual. U.S. Geological Survey Professional Paper 1395. U.S. Government Printing Office. Washington, D. C. 383 pages. Walsh, J. E., and H. J. Zwally. 1990. Multiyear Sea Ice in the Arctic: Model- and Satellite-derived. Journal of Geophysical Research 95:11,613-11,628. Zwally, H. J., C. l. Parkinson, and J. C. Comiso. 1983. Variability of Antarctic Sea Ice and Changes in Carbon Dioxide. Science 220:1005-1012. Zwally, H. J., J. C. Comiso, C. l. Parkinson, W. J. Campbell, F. D. Carsey, and P. Gloersen. 1983. Antarctic Sea Ice, 1973-1976: Satellite Passive-microwave Observations,NASA SP-459, National Aeronautics and Space Administration, Washington, D. C. 206 pages. The following references give background information pertaining to the instruments and sensor-level products used to generate this data set. Other references, particularly for sea ice characteristics and algorithm performance, are available in journals from the NSIDC library. Also, see the Selected Bibliography: SSM/I Brightness Temperatures for the Polar Regions. Cavalieri, D. J., C. L. Parkinson, N. DiGirolamo, and A. Ivanoff. 2012. Intersensor Calibration between F13 SSMI and F17 SSMIS for Global Sea Ice Data Records. Geoscience and Remote Sensing Letters, vol. 9, no. 2, pp. 233-236. doi:10.1109/LGRS.2011.2166754. Gloersen P., W. J. Campbell, D. J. Cavalieri, J. C. Comiso, C. L. Parkinson, H. J. Zwally. 1992. Arctic and Antarctic Sea Ice, 1978-1987: Satellite Passive Microwave Observations and Analysis. NASA Special Publication 511. Gloersen, P. and F. T. Barath. 1977. A Scanning Multichannel Microwave Radiometer for Nimbus G and Seasat A. IEEE Journal of Oceanic Engineering OE-2:172-178. Gloersen P., W. J. Campbell, D. J. Cavalieri, J. C. Comiso, C. L. Parkinson, and H. J. Zwally. 1992. Arctic and Antarctic Sea Ice, 1978-1987: Satellite Passive Microwave Observations and Analysis. NASA Special Publication 511. Goodberlet, M. A. 1990. Special Sensor Microwave/Imager Calibration/Validation. Ph. D. dissertation submitted to the University of Massachusetts. Hollinger, J. P. 1989. DMSP Special Sensor Microwave/Imager Calibration/Validation. Naval Research Laboratory, Washington, D. C.
Hollinger, J. P. and R. C. Lo. 1983. SSM/I Project Summary Report. Naval Research Laboratory. NRL Memorandum Report 5055. 106 pages. Poe, G. A. and R. W. Conway. 1990. A Study of the Geolocation Errors for the Special Sensor Microwave/Imager (SSM/I). IEEE Transactions on Geoscience and Remote Sensing 28(5):791-799. Sun, N. and F. Weng. 2008. Evaluation of Special Sensor Microwave Imager/Sounder (SSMIS) Environmental Data Records. IEEE Transactions on Geoscience and Remote Sensing. 46(4). Svendsen, E., K. Kloster, B. Farrelly, O. M. Johannessen, J. A. Johannessen, W. J. Campbell, P. Gloersen, D. Cavalieri, and C. Matzler. 1983. 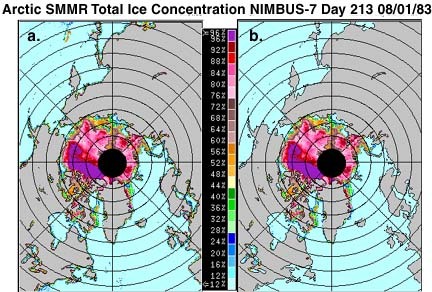 Norwegian Remote Sensing Experiment: Evaluation of the Nimbus-7 Scanning Multichannel Microwave Radiometer for Sea Ice Research. Journal of Geophysical Research 88(C5):2781-2791. Wentz, F. J. 1997. A Well-Calibrated Ocean Algorithm for SSMI. Journal of Geophysical Research. 102 (C4), 8703-8718. Wentz, F. J. 1992. Final Report, Production of SSM/I Data Sets. Remote Sensing Systems, Inc., Santa Rosa, CA. RSS Technical Report 090192. Wentz, F. J. 2013. SSMI Version-7 Calibration Report, Report Number 011012, Remote Sensing Systems, Santa Rosa, CA, 46 pp. Wentz, F. J. 1991. User's Manual: SSM/I Antenna Temperature Tapes. Remote Sensing Systems, Inc., Santa Rosa, CA. RSS Technical Report 032588. Wentz, F. J. 1993. User's Manual: SSM/I Antenna Temperature Tapes: Rev. 2. Remote Sensing Systems, Inc. Santa Rosa, CA. RSS Technical Report 120193. Yan, B., and F. Weng. 2008. Intercalibration Between Special Sensor Microwave Imager/Sounder and Special Sensor Microwave Imager. IEEE Transactions on Geoscience and Remote Sensing. 46 (4, 1): 984-995. Carsey, F. D., editor. 1992. Microwave Remote Sensing of Sea Ice. Geophysical Monograph 68, American Geophysical Union. Washington, DC, 462 pp. Untersteiner, N. 1981. The Geophysics of Sea Ice. Plenum Press, New York and London, 1196 pp. Wadhams, P. 2000. Ice in the Ocean. Gordon and Breach Science Publishers. London. 351 pp. Zubov, N. N. 1943. Arctic Ice. Translated 1963 from Russian. U.S. Naval Oceanographic Office, Washington, DC, 491 pp. Cavalieri, D. J. 1994. A Microwave Technique for Mapping Thin Sea Ice. Journal of Geophysical Research 99(C6):12,561-12,572. Comiso, J. C. 1990. Arctic Multiyear Ice Classification and Summer Ice Cover Using Passive Microwave Satellite Data. Journal of Geophysical Research 95(C8):13411-13422. Comiso, J. C., T. C. Grenfell, M. Lange, A. Lohanick, R. Moore, and P. Wadhams. 1992. Microwave Remote Sensing of the Southern Ocean Ice Cover. Chapt. 12 In:Microwave remote sensing of sea ice. Frank Carsey, editor. American Geophysical Union. Washington, D. C. 243-259. Comiso, J. C. 1995. SSM/I Sea Ice Concentrations Using the Bootstrap Algorithm. NASA Reference Publication 1380. National Aeronautics and Space Administration. Washington, DC. 49 pp. Gloersen P. and D. J. Cavalieri. 1986. Reduction of Weather Effects in the Calculation of Sea Ice Concentration from Microwave Radiances. Journal of Geophysical Research 91(C3):3913-3919. Grenfell, T. C. and J. C. Comiso. 1986. Multifrequency Passive Microwave Observations of First-year Sea Ice Grown in a Tank. IEEE Transactions on Geoscience and Remote Sensing GE-24:826-831. Hollinger, J. P., B. E. Troy, R. O. Ramseier, K. W. Asmus, M. F. Hartman, and C. A. Luther. 1984. Microwave Emission from High Arctic Sea Ice During Freeze-up. Journal of Geophysical Research 89(C5):8104-8122. Kaleschke, L., C. Lupkes, T. Vihma, J. Haarpaintner, A. Bochert, J. Hartmann, and G. Heygster. 2001. SSM/I sea ice remote sensing for mesoscale ocean-atmosphere interaction analysis. Can. J. Remote Sens., 27(5), 526â€“537. Peng, G., W. N. Meier, D. J. Scott, and M. H. Savoie. 2013. A long-term and reproducible passive microwave sea ice concentration data record for climate studies and monitoring. Earth Sys. Sci. Data, 5, 311-318, doi:10.5194/essd-5-311-2013. Spreen, G., L. Kaleschke, and G. Heygster. 2008. Sea ice remote sensing using AMSR-E 89-GHz channels. J. Geophys. Res., 113, C02S03, doi:10.1029/2005JC003384. Swift, C. T., Fedor, L. S. and Ramseier, R. O. 1985. An Algorithm to Measure Sea Ice Concentration with Microwave Radiometers. Journal of Geophysical Research90(C1):1087-1099. Andersen, S., R. Tonboe, S. Kern, and H. Schyberg, 2006. Improved retrieval of sea ice total concentration from spaceborne passive microwave observations using numerical weather prediction model fields: An intercomparison of nine algorithms, Rem. Sens. Environ., 104, 374-392. Andersen, S., R. Tonboe, L. Kaleschke, G. Heygster, and L. T. Pedersen. 2007. Intercomparison of passive microwave sea ice concentration retrievals over the high-concentration Arctic sea ice, J. Geophys. Res., 112, C08004, doi:10.1029/2006JC003543. Cavalieri, D. J., J. Crawford, M. R. Drinkwater, D. Eppler, L. D. Farmer, R. R. Jentz and C. C. Wackerman. 1991. Aircraft Active and Passive Microwave Validation of Sea Ice Concentration from the DMSP SSM/I. Journal of Geophysical Research 96(C12):21,989-22,009. Comiso, J. C., C. L. Parkinson, R. Gersten, and L. Stock, 2008: Accelerated decline in the Arctic sea ice cover, Geophysical Research Letters, 35, 6 pp., L01703, doi:10.1029/2007GL031972. Emery, W. J., C. Fowler, J. A. Maslanik. 1994. Arctic Sea Ice Concentrations from SSM/I and AVHRR Satellite Data. Journal of Geophysical Research 99(C9):18,329-18,342. Ivanova, N., L. T. Pedersen, R. T. Tonboe, S. Kern, G. Heygster, T. Lavergne, A. SÃ¸rensen, R. Saldo, G. DybkjÃ¦r, L. Brucker, and M. Shokr. 2015. Inter-comparison and evaluation of sea ice algorithms: towards further identification of challenges and optimal approach using passive microwave observations, The Cryosphere, 9, 1797-1817, doi:10.5194/tc-9-1797-2015. Ivanova, N., O. M. Johannessen, L. T. Pedersen, and R. T. Tonboe. 2014. Retrieval of Arctic sea ice parameters by satellite passive microwave sensors: A comparison of eleven sea ice concentration algorithms, IEEE Trans. Geosci. Rem. Sens., 52(11), 7233-7246, doi: 10.1109/TGRS.2014.2310136. Kwok, R. 2002. Sea ice concentration estimates from satellite passive microwave radiometry and openings from SAR ice motion, Geophys. Res. Lett., 29(9), doi:10.1029/2002GL014787. Maslanik, J. A. 1992. Effects of Weather on the Retrieval of Sea Ice Concentration and Ice Type from Passive Microwave Data. International Journal of Remote Sensing13(1):37-54. Meier, W. N. 2005. Comparison of passive microwave ice concentration algorithm retrievals with AVHRR imagery in the Arctic peripheral seas, IEEE Trans. Geosci. Rem. Sens., 43(6), 1324-1337. Parkinson, C. L., and J. C. Comiso. 2008. Antarctic sea ice parameters from AMSR-E data using two techniques and comparisons with sea ice from SSM/I, Journal of Geophysical Research, 113, 15 pp., C02S06, doi:10.1029/2007JC004253. Steffen, K., D. J. Cavalieri, J. C. Comiso, K. St. Germain, P. Gloersen, J. Key, and I. Rubinstein. 1992. The Estimation of Geophysical Parameters Using Passive Microwave Algorithms. Chapt 10 In Microwave remote sensing of sea ice. Frank Carsey, editor. American Geophysical Union. Washington, D. C. 243-259. Steffen, K. and A. Schwieger. 1991. NASA Team Algorithm for Sea Ice Concentration Retrieval from Defense Meteorological Satellite Program Special Sensor Microwave/Imager: Comparison with Landsat satellite imagery. Journal of Geophysical Research 96(C12):21,971-21,988. Arrigo, K.R., and coauthors, 2012. Massive phytoplankton blooms under Arctic sea ice, Science, 336, 1408, doi:10.1126/science.1215065. Bintanja, R., G. J. van Oldenborgh, S. S. Drijfhout, B. Wouters, an d C. A. Katsman. 2013. Important role for ocean warming and increased ice-shelf melt in Antarctic sea-ice expansion. Nature Geoscience, 6, 376-379, doi:10.1038/ngeo1767. Brown, Z. W., and K. R. Arrigo. 2013. Sea ice impacts on spring bloom dynamics and net primary production in the Eastern Bering Sea, J. Geophys. Res. Oceans, 118, 43â€“62, doi:10.1029/2012JC008034. Drobot, S., J. Stroeve, J. Maslanik, W. Emery, C. Fowler, and J. Kay. 2008. Evolution of the 2007â€“2008 Arctic sea ice cover and prospects for a new record in 2008, Geophys. Res. Lett., 35, L19501, doi:10.1029/2008GL035316. Drobot, S. D., and J. A. Maslanik, 2003. Interannual variability in summer Beaufort Sea ice conditions: Relationship to winter and summer surface and atmospheric variability, J. Geophys. Res., 108(C7), 3233, doi:10.1029/2002JC001537. Eisenman, I. 2010. Geographic muting of changes in the Arctic sea ice cover, Geophys. Res. Lett., 37, L16501, doi:10.1029/2010GL043741. Eisenman, I., W. N. Meier, and J. R. Norris, 2014. A spurious jump in the satellite record: has Antarctic sea ice expansion been overestimated?, The Cryosphere, 8, 1289-1296, doi:10.15194/tc-8-1289-2014. Francis, J. A., and S. J. Vavrus. 2012. Evidence linking Arctic amplification to extreme weather in mid-latitudes, Geophys. Res. Lett., 39, L06801, doi:10.1029/2012GL051000. Gagne, M.E., N. P. Gillett, and J. C. Fyfe. 2014. Observed and simulated changes in Antarctic sea ice extent over the past 50 years, Geophys. Res. Lett., 41, doi:10.1002/2014GL062231. Gallaher, D., G. G. Campbell, W. N. Meier. 2014. Anomalous variability in Antarctic sea ice extents during the 1960s with the use of Nimbus data, IEEE J. Selected Topics App. Earth Obs. and Rem. Sens., 3(7), 881-887, doi:10.1109/JSTARS.2013.2264391. Holland, M. M., C. M. Bitz, and B. Tremblay. 2006. Future abrupt reductions in the summer Arctic sea ice, Geophys. Res. Lett., 33, L23503, doi:10.1029/2006GL028024. Holland, P. R. 2014. The seasonality of Antarctic sea ice trends, Geophys. Res. Lett., 41, doi:10.1002/2014GL060172. Laidre, K. L., Stern, H., Kovacs, K. M., Lowry, L., Moore, S. E., Regehr, E. V., Ferguson, S. H., Wiig, Ã˜., Boveng, P., Angliss, R. P., Born, E. W., Litovka, D., Quakenbush, L., Lydersen, C., Vongraven, D. and Ugarte, F. 2015. Arctic marine mammal population status, sea ice habitat loss, and conservation recommendations for the 21st century. Conservation Biology, 29: 724â€“737. doi: 10.1111/cobi.12474. Lindsay, R. W., J. Zhang, A. J. Schweiger, and M. A. Steele. 2008. Seasonal predictions of ice extent in the Arctic Ocean. J. Geophys. Res., 113, C02023, doi:10.1029/2007JC004259. Meier, W. N., G. Hovelsrud, B. van Oort, J. Key, K. Kovacs, C. Michel, M. Granskog, S. Gerland, D. Perovich, A.P. Makshtas, and J. Reist. 2014. Arctic sea ice in transformation: A review of recent observed changes and impacts on biology and human activity, Rev. Geophys., 41, doi:10.1002/2013RG000431. Meier, W. N., J. Stroeve, A. Barrett, and F. Fetterer. 2012. A simple approach to providing a more consistent Arctic sea ice extent time series from the 1950s to present, The Cryosphere, 6, 1359-1368, doi:10.5194/tc-6-1359-2012. Meier, W. N., J. Stroeve, and F. Fetterer 2007. Whither Arctic sea ice? A clear signal of decline regionally, seasonally and extending beyond the satellite record, Ann. Glaciol., 46, 428-434. Notz, D., and J. Marotzke. 2012. Observations reveal external driver for Arctic sea-ice retreat. Geophys. Res. Lett., 39, L08502, doi:10.1029/2012GL051094. Notz, D. 2014. Sea-ice extent and its trend provide limited metrics of model performance, The Cryosphere, 8, 229-243, doi:10.5194/tc-8-229-2014, 2014. Parkinson, C. L., and J. C. Comiso. 2013. On the 2012 record low Arctic sea ice cover: Combined impact of preconditioning and an August storm, Geophysical Research Letters, 40, 1356-1361, doi:10.1002/grl.50349. Parkinson, C. L., 2014a: Spatially mapped reductions in the length of the Arctic sea ice season, Geophysical Research Letters, 41, 4316-4322, doi:10.1002/2014GL060434. Parkinson, C. L., 2014b: Global sea ice coverage from satellite data: Annual cycle and 35-yr trends, Journal of Climate, 27 (24), 9377-9382, doi:10.1175/JCLI-D-14-00605.1. Posey, P. G., E. J. Metzger, A. J. Wallcraft, D. A. Hebert, R. A. Allard, O. M. Smedstad, M. W. Phelps, F. Fetterer, J. S. Stewart, W. N. Meier, and S. R. Helfrich. 2015. Improving Arctic sea ice edge forecasts by assimilating high horizontal resolution sea ice concentration data into the US Navy's ice forecast systems, The Cryosphere, 9, 1735-1745, doi:10.5194/tc-9-1735-2015. Rogers, T. S., J. E. Walsh, T. S. Rupp, L. W. Brigham, and M. Sfraga. 2013. Future Arctic marine access: analysis and evaluation of observations, models, and projections of sea ice. The Cryosphere, 7, 321-332, doi:10.5194/tc-7-321-2013. Shu, Q., Z. Song, and F. Qiao. 2015. Assessment of sea ice simulations in the CMIP5 models, The Cryosphere, 9, 399-409, doi:10.5194/tc-9-399-2015. Sigmond, M., J. C. Fyfe, G. M. Flato, V. V. Kharin, and W. J. Merryfield. 2013. Seasonal forecast skill of Arctic sea ice area in a dynamical forecast system, Geophys. Res. Lett., 40, doi:10.1002/grl.50129. Stammerjohn, S., R. Massom, D. Rind, and D. Martinson. 2012. Regions of rapid sea ice change: An interhemispheric seasonal comparison. Geophys. Res. Lett., 39, L05502, doi:10.1029/2012GL050874. Steele, M., S. Dickinson, J. Zhang, and R. Lindsay. 2015. Seasonal ice loss in the Beaufort Sea: Toward synchrony and prediction. J. Geophys. Res. Oceans, 120, doi:10.1002/2014JC010247. Stroeve, J. C., M. M. Holland, W. N. Meier, T. Scambos, and M. Serreze. 2007. Arctic sea ice decline: Faster than forecast. Geophys. Res. Lett., 34, L09501, doi: 10.1029/2007GL029703. Stroeve, J., L. C. Hamilton, C. M. Bitz, and E. Blanchard-Wrigglesworth. 2014. Predicting September sea ice: Ensemble skill of the SEARCH Sea Ice Outlook 2008â€“2013. Geophys. Res. Lett., 41, doi:10.1002/2014GL059388. Stroeve, J. C., V. Kattsov, A. Barrett, M. Serreze, T. Pavlova, M. Holland, and W. N. Meier. 2012. Trends in Arctic sea ice extent from CMIP5, CMIP3 and observations. Geophys. Res. Lett., 39, L16502, doi:10.1029/2012GL052676. Strong, C., and I. G. Rigor. 2013. Arctic marginal ice zone trending wider in summer and narrower in winter. Geophys. Res. Lett., 40, doi:10.1002/grl.50928. Turner, J., T. J. Bracegirdle, T. Phillips, G. J. Marshall, and J. S. Hosking. 2013. An Initial Assessment of Antarctic Sea Ice Extent in the CMIP5 Models. J. Climate, 26, 1473-1484, doi:10.1175/JCLID-12-00068.1. Wang, M., and J. E. Overland. 2009. A sea ice free summer Arctic within 30 years? Geophys. Res. Lett., 36, L07502, doi:10.1029/2009GL037820. Wang, M., and J. E. Overland. 2012. A sea ice free summer Arctic within 30 years: An update from CMIP5 models. Geophys. Res. Lett., 39, L18501, doi:10.1029/2012GL052868. Zhang J., R. Lindsay, A. Schweiger, and M. Steele. 2013. The impact of an intense summer cyclone on 2012 Arctic sea ice retreat. Geophys. Res. Lett., 40, doi:10.1002/grl.50190. Campbell, W. J., P. Gloersen, W. J. Webster, T. T. Wilheit, and R. O. Ramseier. 1976. Beaufort Sea Ice Zones as Delineated by Microwave Imagery. Journal of Geophysical Research 81:1103-1110. Campbell, W. J., W. F. Weeks, R. O. Ramseier, and P. Gloersen. 1975. Geophysical Studies of Floating Ice by Remote Sensing. Journal of Glaciology 15:305-328. Campbell, W. J., P. Gloersen, and H. J. Zwally. 1994. Short- and Long-term Temporal Behavior of Polar Sea-Ice Covers from Satellite Passive-Microwave Observations. Geophysical Monograph 85. Editors O. M. Johannessen, R. D. Muench, and J. E. Overland. American Geophysical Union, Washington, D. C.
Campbell, W. J., P. Gloersen, E. G. Josberger, O. M. Johannessen, P. S. Guest, N. Mognard, R. Shuchman, B. A. Burns, N. Lannelongue, and K. L. Davidson. 1987. Variations of Mesoscale and Large-scale Sea Ice Morphology in the 1984 Marginal Ice Zone Experiment as Observed by Microwave Remote Sensing. Journal of Geophysical Research 92:6805-6824..
Carsey, F. D. 1985. Summer Arctic Sea Ice Character from Satellite Microwave Data. Journal of Geophysical Research 90(C3):5015-5034. Cavalieri, D. J., B. a. Burns, and R. G. Onstott. 1990. Investigation of the Effects of Summer Melt on the Calculation of Sea Ice Concentration Using Active and Passive-microwave Data. Journal of Geophysical Research 95:5359-5369. Cavalieri, D. J., P. Gloersen, C. l. Parkinson, J. C. Comiso, and H. J. Zwally. 1997. Observed Hemispheric Asymmetry in Global Sea Ice Changes. Science 278(5340): 1104-1106. Cavalieri, D. J., and C. l. Parkinson. 1981. Large-scale Variations in Observed Antarctic Sea Ice Extent and Associated Atmospheric Circulation. Monthly Weather Review109(11):2323-2336. Cavalieri, D. J., and C. L. Parkinson. 1987. On the Relationship Between Atmospheric Circulation and the Fluctuations in the Sea Ice Extents of the Bering and Okhotsk Seas. Journal of Geophysical Research 92: 7141-7162. Cavalieri, D. J. and S. Martin. 1994. The Contribution of Alaskan, Siberian, and Canadian Coastal Polynyas to the Cold Halocline Layer of the Arctic Ocean. Journal of Geophysical Research 99:18,343-18,362. Cavalieri, D. J., and S. Martin. 1985. A Passive-microwave Study of Polynyas Along the Antarctic Wilkes Land coast, in Oceanology of the Antarctic Continental Shelf, S. S. Jacobs, ed., Antarctic Research Series, American Geophysical Union, Washington, D. C. vol. 43:227-252. Comiso, J. C. 1986. Characteristics of Arctic Winter Sea Ice from Satellite Multispectral Microwave Observations. Journal of Geophysical Research 91(C1): 975-994. Comiso, J. C., and C. W. Sullivan. 1986. Satellite Microwave and In-Situ Observations of the Weddell Sea Ice Cover and its Marginal Ice Zone. Journal of Geophysical Research 91(C8):9663-9681. Comiso, J. C., P. Wadhams, W. Krabill, R. Swift, J. Crawford, and W. Tucker. 1991. Top/Bottom Multisensor Remote Sensing of Arctic Sea Ice. Journal of Geophysical Research 96(C2):2693-2711. Gloersen, P., T. T. Wilheit, T. C. Chang, W. Nordberg, and W. J. Campbell. 1974b. Microwave Maps of the Polar Ice of the Earth. Bulletin of the American Meteorological Society 55:1442-1448. Gloersen, P., W. Nordberg, T. J. Schmugge, T. T. Wilheit, and W. J. Campbell. 1973. Microwave Signatures of First-year and Multiyear Sea Ice. Journal of Geophysical Research 78:3564-3572. Gloersen, P., E. Mollo-Christensen, and P. Hubanks. 1989. Observations of Arctic Polar Lows with the Nimbus-7 Scanning Multichannel Microwave Radiometer, in Polar and Arctic Lows, P. F. Twitchell, E. A. Rasmussen, and K. L. Davidson, eds., A. Deepak, Hampton, Virginia, 359-371. Gloersen, P., T. C. Chang, T. T. Wilheit, and W. J. Campbell. 1974a. Polar Sea Ice Observations by Means of Microwave Radiometry, in Advanced Concepts and Techniques in the Study of Snow and Ice, H. S. Santeford and J. L. Smith, eds., National Academy of Science 541-550. Gloersen, P., and W. J. Campbell. 1991b. Recent Variations in Arctic and Antarctic Sea Ice Covers. Nature 352:33-36. Gloersen, P. and W. J. Campbell. 1988b. Satellite and Aircraft Passive-microwave Observations During the Marginal Ice Zone Experiment in 1984. Journal of Geophysical Research 93:6837-6846. Gloersen, P., D. J. Cavalieri, A. T. C. Chang, T. T. Wilheit, W. J. Campbell, O. M. Johannessen, K. B. Katsaros, K. F. Kunzi, D. B. Ross, D. Staelin, E. P. L. Windsor, F. T. Barath, P. Gudmandsen, E. Langham, and R. O. Ramseier. 1984. A Summary of Results from the first Nimbus-7 SMMR Observations. Journal of Geophysical Research89:5335-5344. Gloersen, P., H. J. Zwally, A. T. C. Chang, D. K. Hall, W. J. Campbell, and R. O. Ramseier. 1978. Time-dependence of Sea Ice Concentration and Multiyear Ice Fraction in the Arctic Basin. Boundary-Layer Meteorology 13:339-359. Gloersen, P., and W. J. Campbell. 1988a. Variations in the Arctic, Antarctic, and Global Sea Ice Covers During 1978-1987 as Observed with the Nimbus-7 Scanning Multichannel Microwave Radiometer. Journal of Geophysical Research 93:10,666-10,674. Gloersen, P., and W. J. Campbell. 1991a. Variations of Extent, Area, and Open Water of the Polar Sea Ice Covers: 1978-1987, Proc. of the Int. Conf. on the Role of the Polar Regions in Global Change, G. Weller, C. L. Wilson, and B. A. B. Severin, eds.,Geophysical Institute, University of Fairbanks, Alaska. 778 pages. Maslanik, J. A., M. C. Serreze, and R. G. Barry. 1996. Recent Decreases in Arctic Summer Sea Ice Cover and Linkages to Atmospheric Circulation Anomalies. Geophysical Research Letters 23(13):1677-1680. Massom, R. A. 1991. Satellite Remote Sensing of Polar Regions. Boca Raton: Lewis Publishing. Parkinson, C. l., J. C. Comiso, H. J. Zwally, D. J. Cavalieri, P. Gloersen, and W. J. Campbell. 1987. Arctic Sea Ice, 1973-1976: Satellite Passive-Microwave Observations,NASA SP-489, National Aeronautics and Space Administration, Washington, D. C. 296 pages. Parkinson, C. l., and D. J. Cavalieri. 1989. Arctic Sea Ice, 1973-1987: Seasonal, Regional, and Interannual Variability. Journal of Geophysical Research 94:14,499-14,523. Parkinson, C. L., D. J. Cavalieri, P. Gloersen, H. J. Zwally, and C. Comiso. 1999. Arctic Sea Ice Extents, Areas, and Trends, 1978-1996. Journal of Geophysical Research104(9): 20,837-20,856. Parkinson, C. l. 1990. The Impact of the Siberian High and Aleutian Low on the Sea Ice Cover of the Sea of Okhotsk. Annals of Glaciology 14:226-229. Parkinson, C. l., and D. J. Cavalieri. 1982. Interannual Sea Ice Variations and Sea Ice/Atmosphere Interactions in the Southern Ocean, 1973-1975. Annals of Glaciology3:249-254. Parkinson, C. l. 1992b. Interannual Variability of Monthly Southern Ocean Sea Ice Distributions. Journal of Geophysical Research 97:5349-5363. Parkinson, C. l., and A. J. Gratz. 1983. On the Seasonal Sea Ice Cover of the Sea of Okhotsk. Journal of Geophysical Research 88:2793-2802. Parkinson, C. l. 1992a. Spatial Patterns of Increases and Decreases in the Length of the Sea Ice Season in the North Polar Region, 1979-1986. Journal of Geophysical Research 97:14,377-14,388. Parkinson, C. l. 1994. Spatial Patterns of Increases and Decreases in the Length of the Sea Ice Season in the Southern Ocean, 1979-1986. Journal of Geophysical Research 99:16,327-16,339. Shuchman, R. A., B. Burns, O. M. Johannessen, E. G. Josberger, W. J. Campbell, T. Manley, and N. Lannelongue. 1987. Remote Sensing of the Fram Strait Marginal Ice Zone. Science 236:429-431. Smith D. M. 1996. Extraction of winter total sea-ice concentration in the Greenland and Barents Seas from SSM/I data. Int. J. Remote Sens., vol. 17, no. 13, pp. 2625â€“2646. Sullivan, C. W., C. R. McClain, J. C. Comiso, and W. O. Smith, Jr. 1988. Phytoplankton Standing Crops within an Antarctic Ice Edge Assessed by Satellite Remote Sensing. Journal of Geophysical Research 93:12,487-12,498. Zwally, H. J., J. C. Comiso, C. l. Parkinson, W. J. Campbell, F. D. Carsey, and P. Gloersen. 1983b. Antarctic Sea Ice, 1973-1976: Satellite Passive-microwave Observations,NASA SP-459, National Aeronautics and Space Administration, Washington, D. C. 206 pages. Zwally, H. J., T. T. Wilheit, P. Gloersen, and J. l. Mueller. 1976. Characteristics of Antarctic Sea Ice as Determined by Satellite-borne Microwave Imagers, in Proceedings of the Symposium on Meteorological Observations from Space: Their Contribution to the First GARP Global Experiment, Committee on Space Research of the International Council of Scientific Unions, Philadelphia, 94-97. Zwally, H. J., and J. E. Walsh. 1987. Comparison of Observed and Modeled Ice Motion in the Arctic Ocean. Annals of Glaciology 9:136-144. Zwally, H. J., and P. Gloersen. 1977. Passive-microwave Images of the Polar Regions and Research Applications. Polar Records 18:431-450. Zwally, H. J., C. l. Parkinson, and J. C. Comiso. 1983a. Variability of Antarctic Sea Ice and Changes in Carbon Dioxide. Science 220:1005-1012. Martino, M. G., D. J. Cavalieri and P. Gloersen. 1995. An Improved Land mask for the SSM/I Grid. NASA Technical Memorandum TM104625. National Center for Supercomputing Applications. 1993. Getting Started with HDF. Draft Version 3.2. page 44. How do I convert NSIDC-0051 sea-ice concentration data from binary to GeoTIFF?